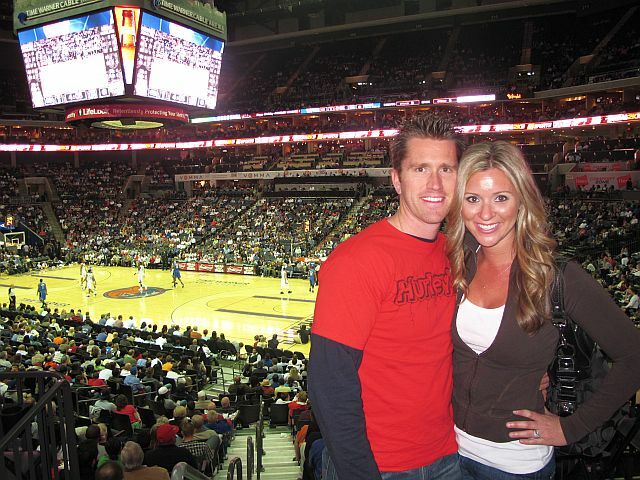 Being that this was our first Bobcats game, it was a great game to see! There was a fight -- which is always fun! There was a time where I was screaming... literally screaming. So clearly I felt the vibes of the crowd and was able to get into the game. Their halftime show, cheerleaders and music were great! And now that Michael Jordan owns them, maybe they'll get some better players. Moving onto important things like... EMILY! 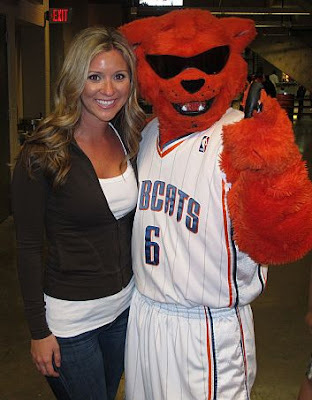 She was sitting front and center at the Bobcats game on Monday night. I went to Thursday nights game. Looks (and sounds) like a great time. :) Fun fun. More important than game - where's Brad? ok you are totally gorgeous, now I want your hair. Now i want to die mine back blonde and have it look like yours. Tell me this though (because I'm nosy and want your hair) do you curl is with a curling iron? Big barrel? I must know. So bummed you went! I posted this on my Facebook to see if anyone wanted to go because there was a great deal on tickets. The Magic is my team! looks like fun!! i love when you find yourself yelling and cheering because you're so into a game...and emily, i adore her!